Hello everyone! I hope you are all having a good Easter Friday. 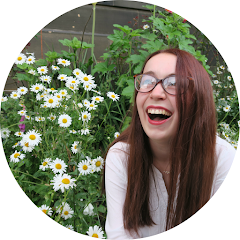 I've been wanting to blog about my crocheting more on my blog so I'm trying that out now! 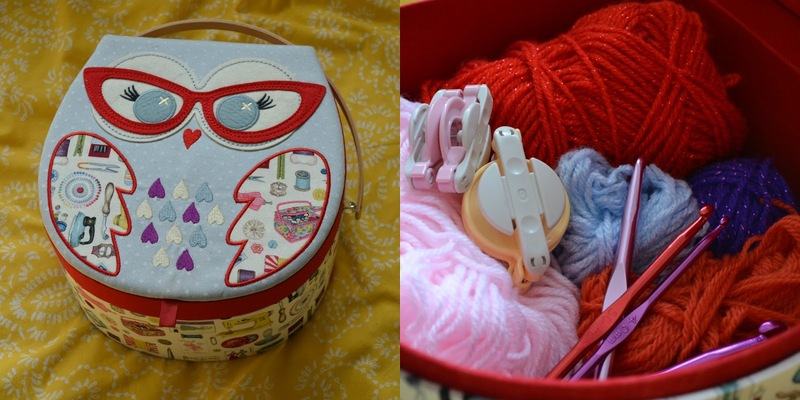 Today I'm going to be blogging about how I store my crafting supplies. I have a lot of wool! Most of my mum's friends have donated some wool to me at some point so I have some everywhere. What's photographed isn't even everything, just the stuff I have proper storage for! 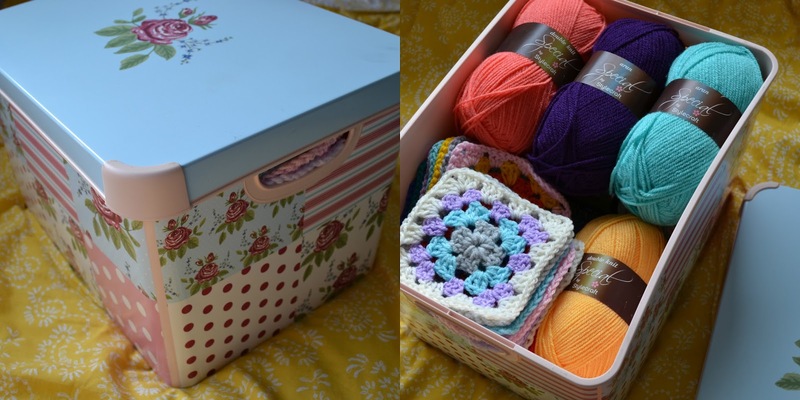 This is the Curver Patchwork Storage Box from Hobbycraft* and I use it to store by 'good quality' wools and works in progress. I like using a box with a lid on it for that sort of thing because it will keep projects really clean and away from any spills and dust. It also means that I can stack other boxes on top of them. Making things more compact and tidy. This box was a Christmas present from my friend Shaira. So I can't tell you where its from, sorry about that! But I just love it, some people have said that the owl kind of looks like me. I think I agree. In this box I store really little bits of wool that I have left over from other projects. That's because this box is a lot smaller. I also keep my crochet hooks and other equipment in here like my pom pom maker! Its just much easier to keep all my crochet hooks in one place because that way when I need them I don't have to search all over the place. You may remember this basket actually, I crocheted it last month. I made this using some tshirt yarn and its so handy to have. I normally keep balls of wool in here that I've already started using. These will be the balls of wool that I'll be trying to use up soon. I'll usually turn to these wools when I want to start a new project but don't know which colour to use. This is the basket that I use to store my finished projects. Well technically, that elephant still needs its ears sewn on but you get the point! What you can see here is some ear warmers and some scarves. Its nice to have all my finished projects on hand in case someone asks to see them. I know where they all are! This box is from Morrisons and I think it was about £3-5. I really like it. The cream colour makes the colour of all my projects really stand out and I like it! I've also been thinking about writing a Q&A about my crocheting. If you've got any questions about it please leave them in the comments and I will write that post, hopefully it would be quite interesting! Also leave a comment telling me about how you store your craft supplies if you have any!